For-Profit Charters Set To Run Pa. District's Schools : NPR Ed Pennsylvania's worst-performing district would have all of its schools run by a private charter school company. 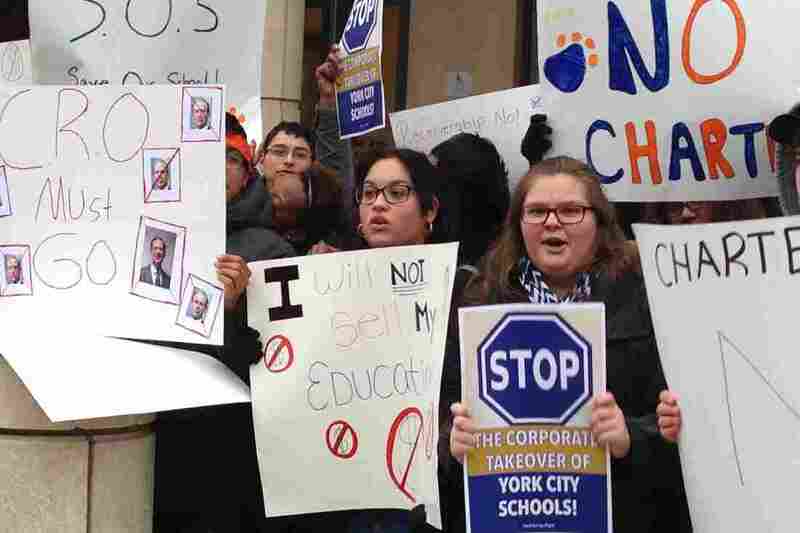 High school students protest the pending state takeover and privatization of the York, Pa. School District. It's been a hectic couple of months for anyone watching the York school district in Pennsylvania. The district is facing a state takeover and may be about to go all-charter, handing control of education to a for-profit company called Charters USA. It's a drastic response to the dire situation in city's schools, both financially and academically. Test scores are the worst of all Pennsylvania's 500 districts, and the proposed turnover is the latest twist in a long-running controversy over the future of the York schools. Despite the district's problems, High school senior Ashlee DeSantis protested outside nearly every hearing on proposed state takeover. "So this is to show anybody who's driving by, the chief recovery officer, anybody in the community, to show them we actually do care," says DeSantis, as other students chant in the background. "We care about our school, we love our school and we love public school. We don't want receivership to happen here." Eighty-four percent of York students live in poor households and the city's stagnant tax base largely caused the financial problems at the heart of the state's takeover bid. York school officials are fighting the court decision to approve a state receivership. But if it stands, the state plans to turn over the school system to Charter Schools USA, a for-profit company with 70 schools in seven states. York would become one of very few all-charter urban districts in the U.S. — and one of the largest. Rand Quinn, a professor at the University of Pennsylvania's graduate school of education, says controversy in these scenarios is almost unavoidable. "We can almost expect contention regardless of what these choices are, and how well thought out and deliberate and reasonable they may seem," says Quinn. York already has a handful of charter schools, and results are mixed. Some of its existing charters post better scores than the district. But the highest performance comes from a school with students from two suburban districts as well as the city. Another charter with the worst scores later closed. Quinn says that's how it's supposed to work. "There's this idea of competition and innovation and choice that's embedded in the logic of this method of reform," says Quinn. "The good schools and the good teachers thrive, and the underperforming schools and underperforming teachers are removed from the system." Charter Schools USA will have to meet performance standards, or face losing its charter. But the contract isn't final yet. And incoming Gov. Tom Wolf hasn't said what he'll do if it is finalized before his term starts. Wolf opposes privatizing education in York. But hasn't put forth another suggestion to fix city schools. Wolf has promised changes in the state's school funding formula, and they would affect the district, but any impact from those changes would take time. Department of Education spokesman Tim Eller says York school officials have moved too slowly for years. "The board's continued delay in taking action just further delays the recovery process and further impacts students," says Eller. But critics say the state is just rushing to bring Charter Schools USA to York before Wolf takes office. Emily Previti is a reporter for Keystone Crossroads, a statewide public media initiative reporting on the challenges facing Pennsylvania cities.